Rarely does a product configuration mark pass TTAB muster [IIRC, the Baldwin key shape was the last one (here); Oops! except for this one], but it just happened in In re Carl Walther GmbH, Serial No. 77096523 (October 26, 2010) [not precedential]. 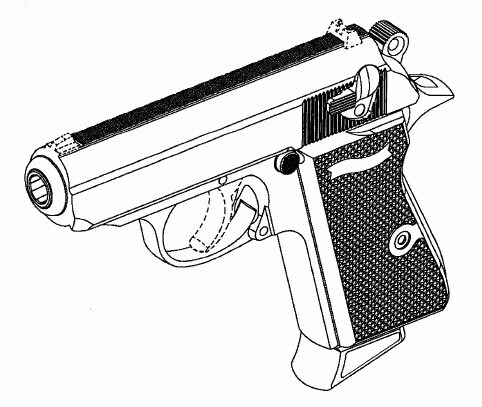 The Board reversed a refusal to register the mark shown below for "firearms; pistols; and air soft guns," finding that Applicant Walther had established acquired distinctiveness for the product design under Section 2(f). Walther submitted the results of an on-line survey showing that "over half of the survey participants associated PPK handgun design with a single source and approximately one-third of the participants were able to correctly identify the source." The Board cast aside the Examining Attorney's criticisms of the survey, but pointed out that the survey results alone were not conclusive on the issue of acquired distinctiveness. Additional evidence included a declaration from a handgun expert "knowledgeable about the marketplace for handguns and, in particular, how and why consumers make their purchasing decisions regarding certain handguns." [The Board called this direct evidence of acquired distinctiveness, but it seems indirect to this writer]. Circumstantial evidence included advertising and promotional efforts since 1968, the Board particularly noting that "applicant often presents the PPK handgun with a full pictorial representation and touts the 'sleek, elegant lines have excited shooters from the moment it was created over 75 years ago.'" 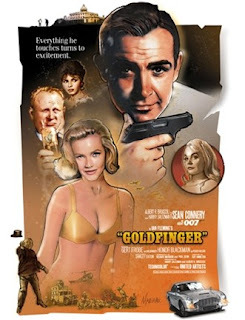 Walther also benefited from extensive, unsolicited media coverage: the PPK handgun was used as a prop in nearly all of the James Bond films and is frequently referred to as "James Bond’s weapon of choice." The popularity of the gun design is also evidenced by the fact that it is "imitated, under license, through replica products such as air pistols." According to the Board, "[i]t simply stands to reason that a party would only attempt to replicate another party’s trade dress or product configuration, under license or not, if that trade dress or product configuration is perceived by the consumers as distinctive." [What if it's just an attractive design but not a source indicator? -ed.]. And so the Board concluded that Walther "established a prima facie case that the PPK handgun design involved ... has acquired distinctiveness within the meaning of Section 2(f) of the Trademark Act." The Examining Attorney failed to rebut that showing, and so the Board reversed the refusal. For a recent article on Internet surveys, read Hal Poret, "A Comparative Empirical Analysis of Online Versus Mall and Phone Methodologies for Trademark Surveys," 100 Trademark Reporter 756 (May-June 2010). [pdf here]. Ouch! Trumped by my own blog posting!